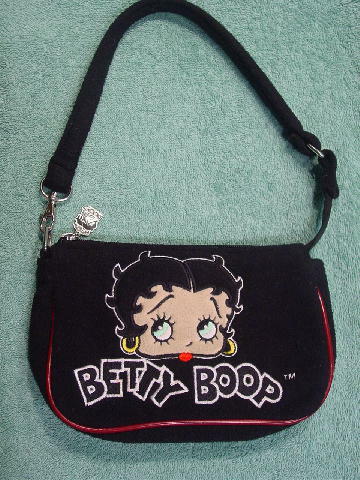 This black fabric Betty Boop  purse © is a 2004 King Pictures Syndicate Inc. The back is plain and both the front and back have a light burgundy cord edging. The front has her head outlined in white with a sand color face, light green eyes, red lips, and yellow earrings. Below her face is Betty Boop  outlined in white threads. There is a top side to side zipper which extends on the right up to the base of the 17" by 3/4" wide handle. 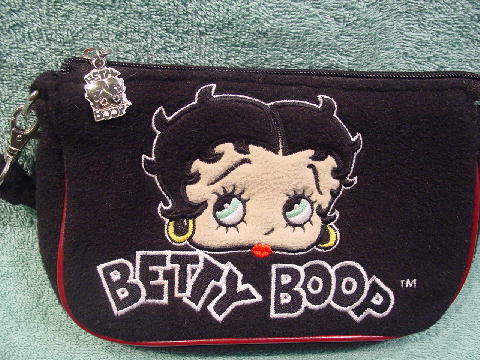 The silver-tone metal pull is Betty's face and Betty above her head and Boop below her cheeks. The left side of the handle is attached by a silver-tone large lobster clasp. 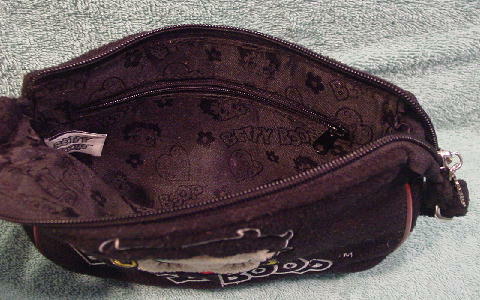 The black fabric lining has Baby Boop, hearts, flowers, and Betty's face all over it. It goes well with the Betty Boop blouse.